The increasing incidence of microbial infestation of packaged food is fuelling the growth of antimicrobial packaging market. In several parts of the world, strict regulations in place to safeguard the quality of packaged food, manufacturers of packaged food need to adhere to packaging guidelines laid down by statutory bodies. This is stoking demand for antimicrobial packaging solutions. Moreover, rising foodborne and waterborne diseases, and growing awareness to minimize food wastage that can help with food shortage issues are some other key factors benefitting the antimicrobial packaging market. On the flip side, lack of infrastructure for antimicrobial packaging facilities and lack of awareness are some bottlenecks to the growth of antimicrobial packaging market in emerging economies. A report by Transparency Market Research projects the global antimicrobial packaging market to expand at a healthy CAGR of 5.6% between 2016 and 2024. At this pace, the market is likely to reach a valuation of US$11.88 bn by 2024, increasing from US$7.65 bn in 2016. The report studies the global antimicrobial packaging in terms of packaging type, application, material, antimicrobial agents, and technology. By material, paperboards, plastics, tin, and other minority materials are key segments into which the antimicrobial packaging market is divided in this report. Of them, demand for plastics surpasses all because of their physical, chemical, and mechanical properties over other materials. Moreover, plastics allow easy insertion of vacuum or gas as antimicrobial agents. In addition, physical properties of plastics that allows them to be easy to mold, display sufficient elasticity, enable multi-layered packaging at affordable price, and is strong to be easily damaged account for their large share in the antimicrobial packaging market. Based on antimicrobial agent, the global antimicrobial packaging market is divided into enzymes, metal ion and oxidizers, bacteriocins, essential oils, organic acids, and others. In terms of package type, the antimicrobial packaging is divided into bottles and cans, trays, bags, pouches, carton packages, cups and lids, and others. Application-wise, food and beverages, personal care, healthcare, and others are key end-use industries of antimicrobial packaging market. Geography-wise, the global antimicrobial packaging market is divided into five key regions, namely North America, Asia Pacific, Europe, Latin America, and the Middle East and Africa. Vis-à-vis revenue, Asia Pacific held the leading 33.3% of the market in 2015. The stellar growth of the region is attributed to rapid economic growth in emerging economies of the region over the past few decades. Key companies operating in the global antimicrobial packaging market include LINPAC Senior Holdings Limited, BASF SE, PolyOne Corporation, Mondi plc, The Dow Chemical Company, Barr Brands International, and BioCote Limited. Globally, growing sensitivity towards food wastage at different levels has increased demand for antimicrobial packaging, as food companies provides food products in different sizes. Antimicrobial packaging also helps in extending shelf life of food products. Moreover, the U.S. FDA has observed growth of antimicrobial agents used in food products. Such organizations recommend higher use of antimicrobial packaging especially in the food and beverages industry. The global antimicrobial packaging market is characterized on the basis of technology, material, package type, application, and antimicrobial agents. Based on material type, the market is segmented into paperboards, biopolymers, plastics, tin, and other. Among these, plastics are the most liked material and has gained huge popularity. They are flexible, tear-resistance, and effortlessly pliant are the key properties of plastics due to which they are widely used in the global antimicrobial packaging market. The report elucidated on the key parameters driving growth in the global antimicrobial packaging market. Information presented includes trend and opportunities that is driving the growth in the market. It also includes restraints and challenges that might limit the growth of the antimicrobial packaging. With these insights, key stakeholders in the global antimicrobial packaging market can take well-informed decisions. Rising demand for packaged food is the major factor driving demand in the global antimicrobial packaging market. Antimicrobial packaging helps prevents the growth of microorganisms and ensures the safety of the food products. Products with antimicrobial packaging are preservative free and require minimal processing. Storage temperature also plays a vital role, as it determines the growth of potential microbes. Therefore, there is a demand for properly designed antimicrobial packaging system that helps in reducing food borne diseases. Moreover, healthcare furnishing manufacturers are introducing innovative products that have effective microbial resistant properties thus, preserving aesthetic value of hospitals. Antimicrobial additives are also used to prevent microbial growth and increase the hygienic factor among patients. With respect to geography, the demand for antimicrobial packaging is seen in the Asia Pacific region. In the 2015, Asia Pacific antimicrobial packaging market held 33.3% share in the overall market. High demand for packaged food in developing regions especially among young adults has boosted growth in the global antimicrobial packaging market. In addition, growing prevalence of diseases has also resulted in the regional growth. India and China are prospective markets in Asia Pacific due to the large number of young population having high demand for packaged food. 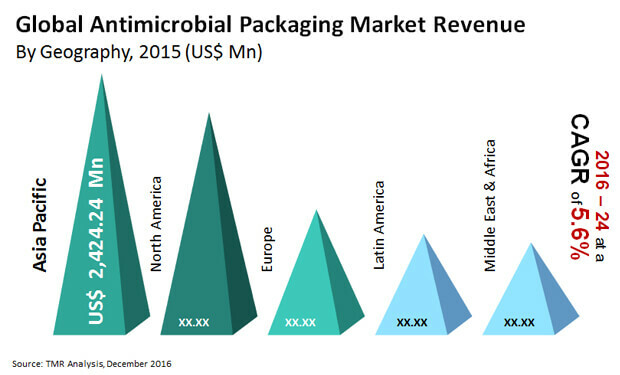 In fact, players in the global antimicrobial packaging market are investing heavily in these countries have huge growth potential. Some of the prominent players operating in the global antimicrobial packaging market are The Dow Chemical Company, LINPAC Senior Holdings Limited, PolyOne Corporation, Mondi plc, BASF SE, Barr Brands International, and BioCote Limited. The presence of large number of players in the market is expected to increase the competition in the global antimicrobial packaging market. Leading players are investing heavily in the developing regions due to the increasing demand for convenience food. In addition, rising health concerns and the urge to know about the details of the food products is also expected to create new growth opportunities for the players.